Would ever believe that I HATED pizza growing up? In fact, I don’t think I liked it all until 6th grade. You see, in 6th grade I was attending Harmony Elementary School in Vanouver, Washington and as the oldest kids we got to have lunch in our classrooms. Yeah, we were pretty big stuff. And to make it even more exciting we actually got to order pizza on Fridays. BOOYAH! I can still smell it Oh my gosh, we thought we were awesome. The kind was always the same, Pepperoni Pizza. 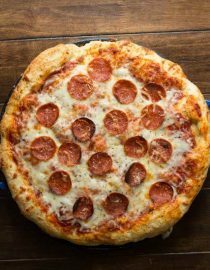 But, we all grew up and now while I still love a good takeout pizza I also want a pepperoni pizza recipe that’s as good to make at home as it is to have delivered. 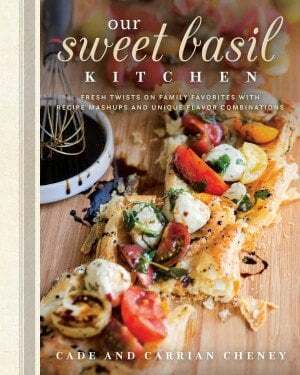 Which means that we’ve been working on this recipe for 2 months, and testing every ingredient out there. There are two kinds of pizza, and only two. Bet you already knew that though, right? There’s take out which is greasy, gooey, and crazy delicious. This is best eaten when you are feeling lazy, depressed, partying, or chillin’. But, there’s also pizzeria pizza. This pizza is the real deal. It’s generally more like an actual Italian or New York Style pizza. The ingredients are generally better and it’s usually found in pizzerias or awesome Italian restaurants. They are different. Period. A chain pizza place versus the gourmet deal. And each has it’s moment, but today we want to talk about delivery. I know, you probably didn’t think I was going to say that, but everyone has had a hankering for delivery, the one you want on a Saturday night while you kick back and watch a movie. 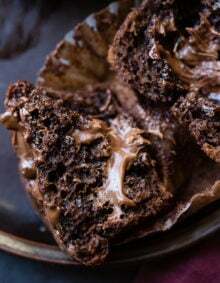 We tested so many ingredients, pans, recipes, and temperatures and these are the ones that came out with the best results. Gosh, it’s like I’m America’s Test Kitchen! LOVE THEM. Flour: King Arthur All purpose Flour produced the best crust. We did try using half and half with bread flour or all bread flour, but that crusty, chewy crust was best with all purpose. Yeast: Red Star Yeast was the most full proof yeast. We got a perfect rise every time, and it produced a chewy crust. Pepperoni: We found that the Margherita Brand of Pepperoni produced the best flavor and texture. Some pepperonis were rubbery and extra greasy when baked, but Margherita brand crisped up a little around the edges, and had great flavor and texture. It literally was night and day difference. Unfortunately no other brand came close enough to compare so we say stick with this one. 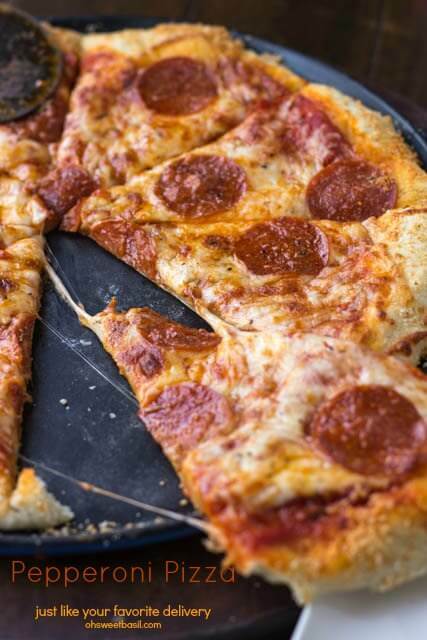 *TIP* We found that cooking the pepperoni for 15-20 seconds on paper towels in the microwave removed a little more grease and produced those crisped edges we love on delivery pizza. Cheese:Oh the cheese… this one was also tricky. Too many Mozzarella’s didn’t melt down well enough or were lacking flavor. Fresh mozzrella or water packed was cray good, but better suited for Margarita pizzas. We found that Galbani provided that perfect cheesy flavor with great meltability. Pan: This one probably doesn’t seem crucial but it made a HUGE difference in our pizza. We tried everything from air bakes and pizza stones to regular pizza pans, but nothing compared to the Mario Batali Pizza Pan. 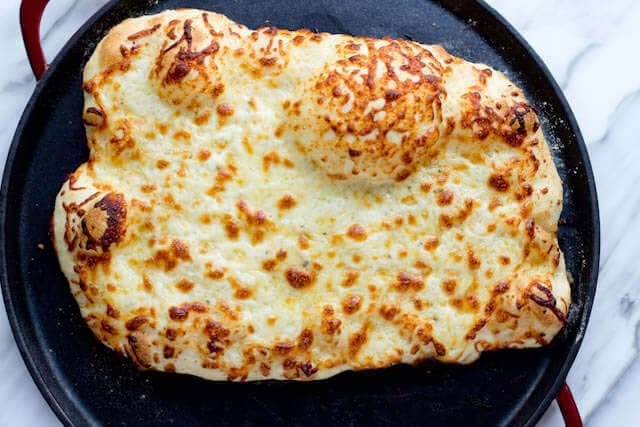 It gave an even distribution of heat, retained heat, held up to high temperatures and helped to make a perfect crust with a crispy bottom and soft chewy inside. Plus, this one actually has a lifetime warranty and was 10x easier to clean up. 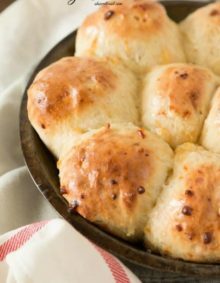 Pizza Dough : I’ll be honest, we tried half a bazillion pizza dough recipes, including making our own, but the fact remains, Artisan Bread in 5 is still the best pizza dough recipe we’ve tried. 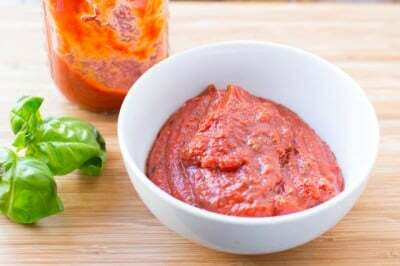 Pizza Sauce: We tried jarred sauces, pizza sauce recipes and even a fresh tomato sauce, but our favorite ended up being our own pizza sauce that we posted on Monday. Pizza Tools: We found out that King Arthur Flour has an awesome pizza tool kit so you can chop, grate and slice to your little heart’s desire! Can Pizza Dough Be Made Ahead? You can make your pizza dough ahead of time, even the night before. Simply wrap the dough in plastic wrap after it has risen once. Store in the refrigerator until ready to bake. Let the dough warm, and rise, then roll out and top it and bake it. You can freeze pizza dough to be used later. Let the dough rise once, then divide it into balls for each pizza. Wrap in plastic wrap and freeze for up to 3 months. How Long will Pepperoni Keep? Unopened pepperoni can be stored for up to 6 weeks in the pantry or indefinitely in the refrigerator. 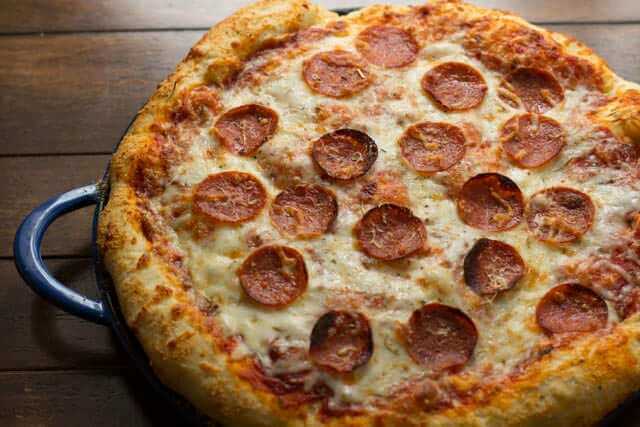 Once pepperoni is opened, it should be stored in the refrigerator and will keep for 3 weeks. Slowly add the flour without kneading. Transfer dough to large bowl. Cover (not airtight), and allow to rest at room temperature until dough rises and collapses (or flattens on top), approximately 2 hours. The dough can be used immediately after the initial rise, though though not only is it easier to handle when cold, but I think it also produces a better crust. 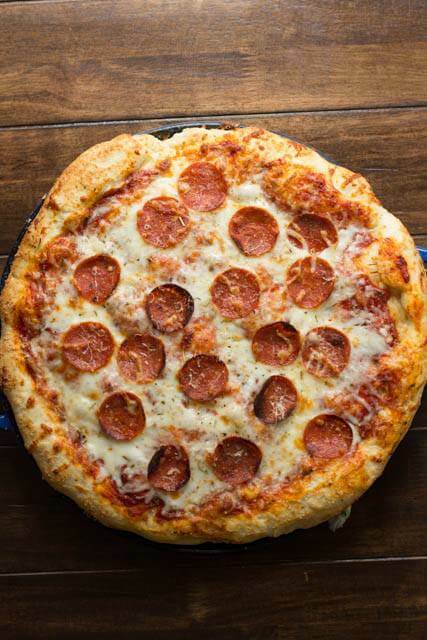 Stretch the pizza dough into a large circle by holding it up in front of you and turning the dough clockwise, grabbing quickly with one hand after another or by tossing the dough. This creates a better crust, but you can roll it out if you wish. 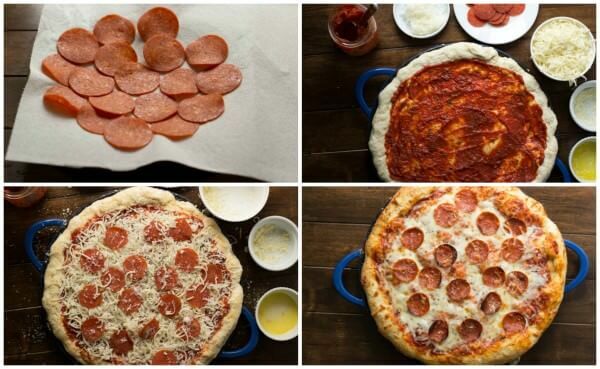 Place on a pizza wheel or parchment paper to help you to transfer the dough to the pan. Working fast, spread a little sauce on the pizza, top with both cheeses and then the pepperoni. Sprinkle 2 Tablespoons of cheese over the finished pizza. Combine the olive oil and butter and brush the crust then sprinkle the parmesan and garlic salt over the crust. Bake the pizza for 6-8 minutes. Remove from the oven and allow to cool for 2 minutes before cutting into. The dough can be used after resting for two hours but not only is it easier to use after being in the fridge, but we found it created a better crust too. This dough can be stored for up to two weeks in the fridge. Extremely good pizza…probably the best crust I have found yet and I have tried at least fifty different crust recipes. I am EXTREMELY picky about my pizza crust. This is an absolute winner. My only change (haha, there are always changes), is I cooked my pizza in a cast-iron skillet with two tablespoons of oil (heated the skillet in the oven without the oil) because my pizza stones are in storage. I also buttered the crust and added Eden Foods Gomasio (sesame seed/sea salt blend), garlic powder, and kosher salt to the crust. That is just my personal preference, as I love flavored crust. I also refrigerated the dough six hours after rising and let it sit for 30 minutes before patting it out. Perfect! Thanks for the feedback Kellie! That means a lot coming from a picky crust person! 🙂 I love the sound of your seasoning! I will have to try that! I’ve left positive comments before, but after making this recipe, I had to write and tell you how awesome this pizza is. I’ve used your recipe for pizza sauce many times, and it can’t be beat. 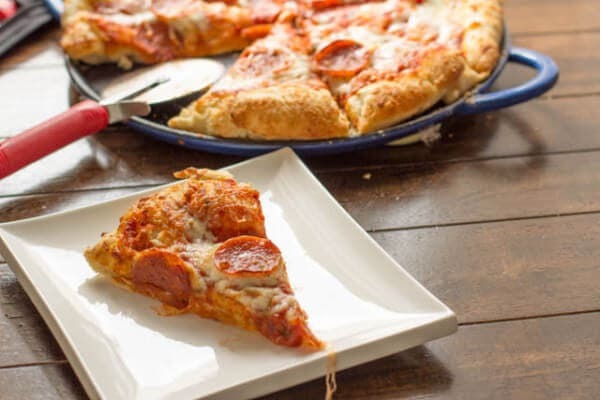 This pepperoni pizza recipe is fabulous. My husband loved it, and he’s somewhat picky about his pizza. 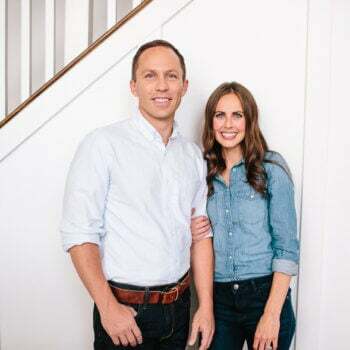 I also appreciate that you and Cade make your family a priority, and your positivity is uplifting. Keep doing what you’re doing…it’s much appreciated. Kay, That’s such a kind comment to leave. I’ll be honest, I was bracing myself after you said you’ve left positive comments before. I thought you were going to say, but this is not one of those times, haha! Thank you, thank you for being so supportive and yay for a pizza win!! xoxo! Hot oven is 1 key, preheat at least an hour. And u will think im nuts but if you grate your cheese and freeze your cheese for even 15/20 minutes, u wont believe the difference. I’m so glad to hear that! I think all of our pizzas have gotten better with time as well. Everyone mixes and shapes differently so it takes time to get in the groove. And we happen to be having pizza tonight so hooray for Monday! This pizza was absolutely delicious! I really want to make it my go-to pizza recipe, but I will have to figure out the crust thing. After the fact, I realized this dough recipe makes enough dough for what seems like two party sheet pizzas. I cut in it half and put half in the fridge and made one big pizza, basically the size of my large rectangular pizza stone, but I still ended up with about an inch thick crust which made the toppings seem skimpy. We’ve been eating the leftovers just dipped in the leftover sauce (which is amazing!) so it’s still delicious, but I really would love to figure out how to get it to turn out like your picture. In any case… it’s still better than any other I’ve tried, so thank you! If it makes to much dough just section off what you need and store the rest in ziploc bags in the fridge. It’s just trial and error to get it just right for your pan, oven, etc. 🙂 The dough freezes really well so you can just use what you need. We do ours by hand sometimes, and it’s not as flexible but you can totally do it. Just put a little muscle into it and stir until smooth or go ahead and knead until smooth. 🙂 And if you’re already cooking you’ll be awesome by the time you have your mixer! OOoops! Yes, that got cut out.I fixed it. So you brush the crust with butter then sprinkle with cheese and garlic salt. You don’t have to, but we love it. Please help me as I’m so confused. In the recipe above it says to put the ingredients into the stand mixer with the dough hook, but then on the next line it says to add the flour, but don’t knead. Well, why put it in the stand mixer with the dough hook? And if you don’t knead it, do you stir it or something? 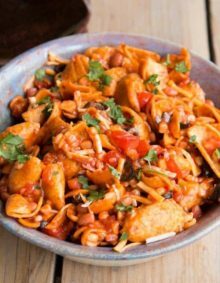 Hi Sarah, you’ll want to use the dough hook in order to help the dough be brought together and pull away from the bowl as well as still work the gluten without doing it in such a forceful way that hand kneading does. The dough hook will stir together the ingredients, then add the flour and it will allow the dough to ball up on the hook unlike the beater blade that breaks the dough up and allows it to move through the holes. I hope that makes sense! It’s a fantastic dough recipe!